Yes, I know, I should have recapped this BEFORE recapping our Ironman but that's not how life has gone this year. Back in June, Mike and I were supposed to race the Rev3 Quassy 70.3. Due to needing to get the old house on the market and my trip to California only being 3 days after the race, we decided to transfer to the Rev3 Cedar Point 70.3 (next weekend). Unfortunately, that meant we only had one triathlon this year prior to our Ironman. 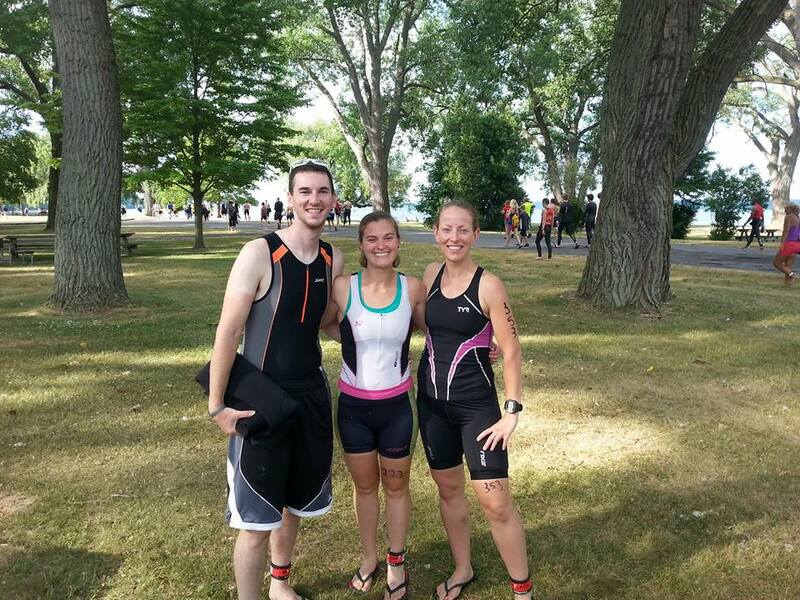 We participated in the Musselman weekend for the fourth year in a row by doing the Mini Mussel sprint triathlon. Luckily, our friend, Janell, was also racing Mini Mussel. 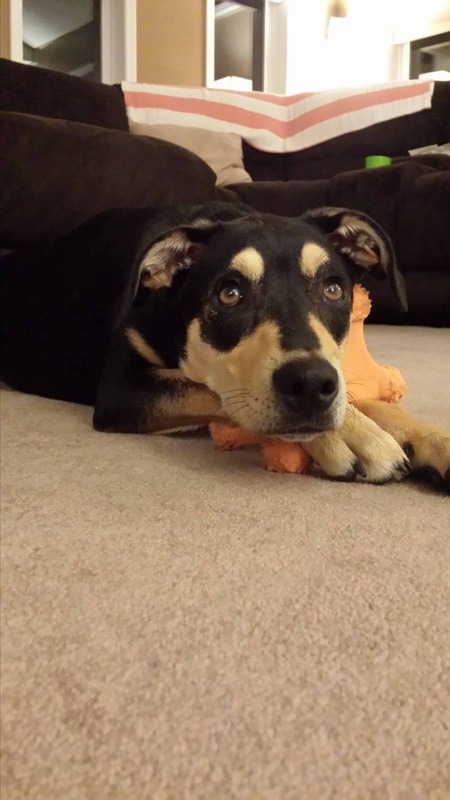 She, her husband, Aaron, and their new dog, Macey, were our first visitors at our new house! Friday night we went to packet pickup and then waited for Janell and Aaron to get to our house (also from packet pickup). We had dinner and talked with them before it was time to go to bed. Geneva isn't too far away from Rochester, and thankfully, the sprint starts at 9am. We left our house and made the drive to the race start. We got there a bit later than we normally do, but not by too much. 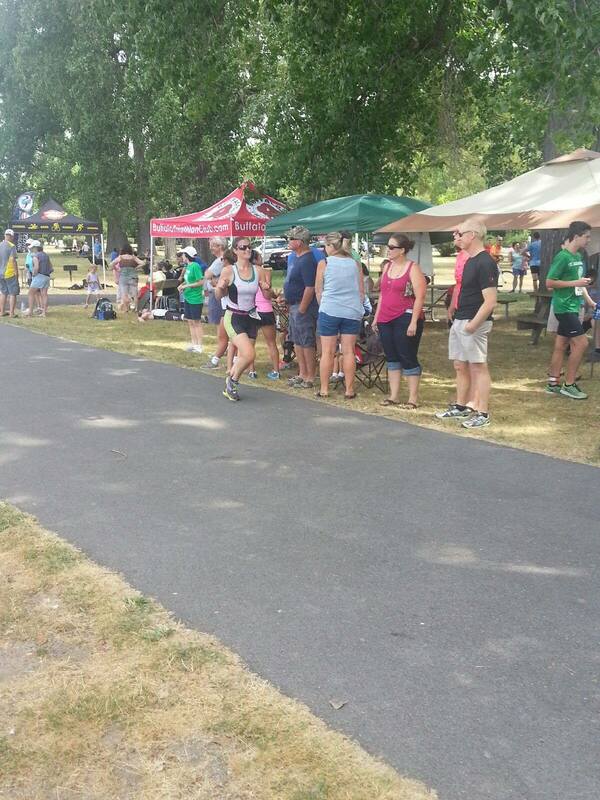 We all had plenty of time to get body marked, set up our transition areas and use the port-a-potties. Mike was the first one to start off and then I went off a few minutes after him. Janell was two waves after me. 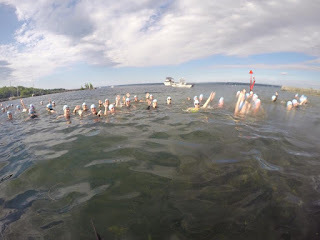 I felt like we had been treading water for a long time, and later Aaron told us that my wave was in the water the longest, but finally the announcer said we had one minute until the start. 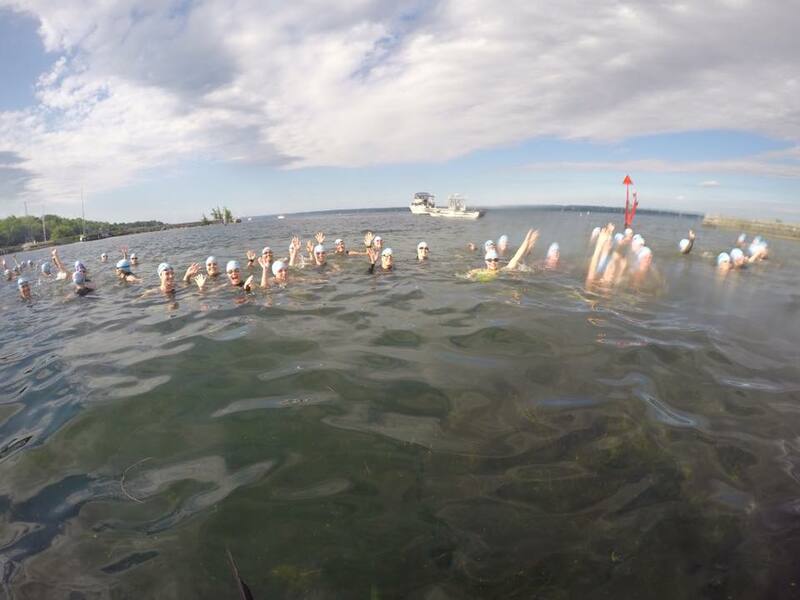 I started out a bit too fast, especially considering the swim leg of this race was our first open water swim of the year. Oops. I was able to slow down a little bit and then focused on getting to the turn toward the finish. A sprint swim is just so short! I didn't have to fight for a position too much, and I did pass some people from the wave ahead of me. After a few minutes, I saw the buoy for the finish. I made sure to swim until my hand hit the bottom of the boat ramp a few times, and then I popped up out of the water. I ran into the transition area, and got my biking stuff on pretty quickly. I felt slow, but that's probably because we also hadn't done very many bricks during training. Again, like last year, I hated running over the cobblestones in my bike shoes but I made it to the mount line in a decent amount of time. I just really don't like the beginning of this bike course. A few weeks prior to the sprint, Mike and I rode the 70.3 bike course which starts the exact same way. I struggle to push the speed on the slight incline the first few miles. The bike was relatively uneventful, I felt like I was going somewhat slow but that was a given considering our lack of training at this point. I love when you get to the turn where the sprint bike course deviates from the 70.3 bike course. It is downhill and the only real place where you need to pay attention is when you ride over some railroad tracks, but of course the Musselman crew has everything clearly marked on the roads so you know what is coming up! 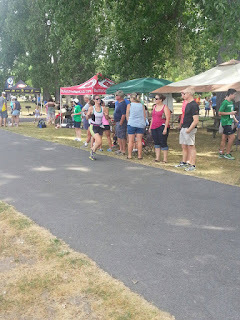 As I made my way back toward the transition area, I was wondering how the run leg was going to go. For some reason, running has felt the worst for me ever since my 50 miler back in November. I hoped that I would be able to get through it easily enough, but I knew that it was getting hotter out. Finally, I turned back into the park and rode a little bit toward the dismount line. As I got there another participant was FLYING in to the dismount line. He really needed to calm down a little bit, it isn't worth it to hurt other people. Normally I would take my bike shoes off, but I don't remember if I did or not at this point. I got to my bike and then put on all of my running stuff. As I ran out I felt heavy but I tried to push the pace as much as I could. I am actually really, really disappointed in this run leg. I think I just gave in too quickly and I should have pushed myself harder (but to be honest that's where my mental state and view on my training was at this point in my life). I saw Mike about 1 mile in to the run leg, after I had been listening to someone who was just out for a run (not part of the race) yelling at everyone coming back toward the finish, "you're almost done!" I was not having it. Luckily, she went away and I kept going. It was hot out and I grabbed some water at the aid station. I did walk a little before the turn around and I had seen our friend Mark making his way back toward the finish line. When I started to make my way back to the finish, I saw Janell. She looked really strong! I did walk a few more times (this is what I mean by pushing myself and staying stronger, oh well). As I got closer to the finish, I saw our friend Sarah! She looked great and I was really proud of her for doing the race! As I made my way closer to the finish, our friends Kathy and Jamie were cheering me on (they had come to our rescue during one of our botched training rides, so thankful for them!) Then I saw Mike and Aaron on the side lines and I ran through the finish line. As I did, Mary Eggers (the announcer), said, "here's Jamie, no stranger to the finish line!" And with that, our fourth year of the Musselman weekend was over! Even though this was my slowest Mini Mussel time yet, I was alright with it. 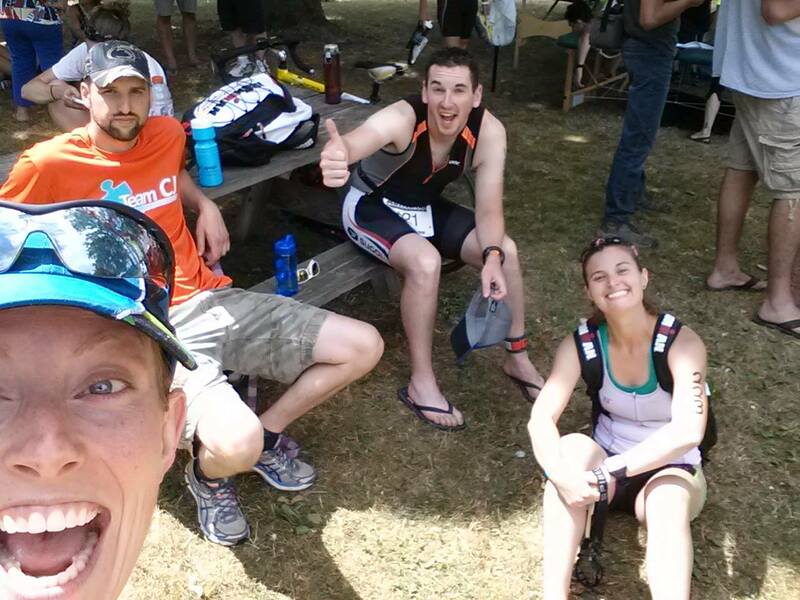 I knew that our training was lacking and I still had a great time being at a race that I love. We hung around for the awards since Janell placed in her age group, and then we spent the rest of the weekend hanging out with Janell and Aaron. I was really happy to share this special race with Janell, and I hope she comes next year to race the Musselman 70.3 with us! Congrats! I'm a long distance runner myself, but wouldn't be able to make it even two feet on a bike or in the water. I hope that a triathlon is something I can tackle someday. It looks like a rewarding experience, especially when done as a team!